Most cells in your adult body are “terminally differentiated” – meaning that they have developed from stem cells into the final liver, or heart, or muscle or endothelial cell that they were meant to be. From that point onward, cells are able to “remember” to stay in this final state – in part – via stable patterns of DNA methylation that reinforce the regulation of “the end state” of gene expression for that cell. As evidence for this role of DNA methylation, it has been observed that levels of DNA methyl transferase (DNMT) decline when cells are fully differentiated and thus, cannot modify or disrupt their patterns of methylation. NOT the case in the brain! 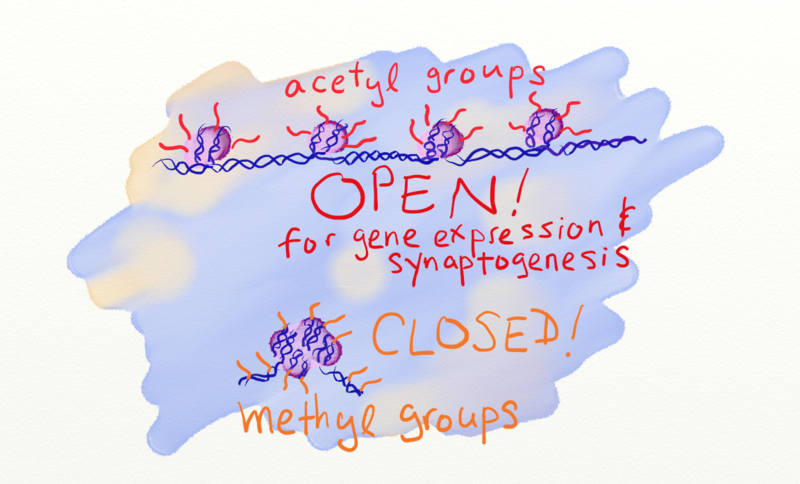 Even though neurons in the adult brain are fully differentiated, levels of methyl transferases – DO NOT decline. Why not? Afterall, we wouldn’t want our neurons to turn into liver cells, or big toe cells, would we? DNA methylation could have lasting effects on neuronal gene expression and overall functional state. We hypothesize that direct modification of DNA, in the form of DNA (cytosine-5) methylation, is another epigenetic mechanism for long term information storage in the nervous system. By measuring methylated vs. unmethylated DNA in the promoter of the reelin and BDNF genes and relating this to electrophysiological measures of synaptic plasticity, the research team finds correlations between methylation status and synaptic plasticity. More specifically, they find that zebularine (an inhibitor of DNMT) CAN block long-term potentiation (LTP), but NOT block baseline synaptic transmission nor the ability of synapses to fire in a theta-burst pattern (needed to induce LTP). This suggests that the epigenetic machinery used for DNA methylation may have a role in the formation of cellular memory – but not in the same sense as in other cells in the body – where cells remember to remain in a terminally differentiated state. In the brain, this epigenetic machinery may help cells remember stuff that’s more germane to brain function … you know … our memories and stuff. 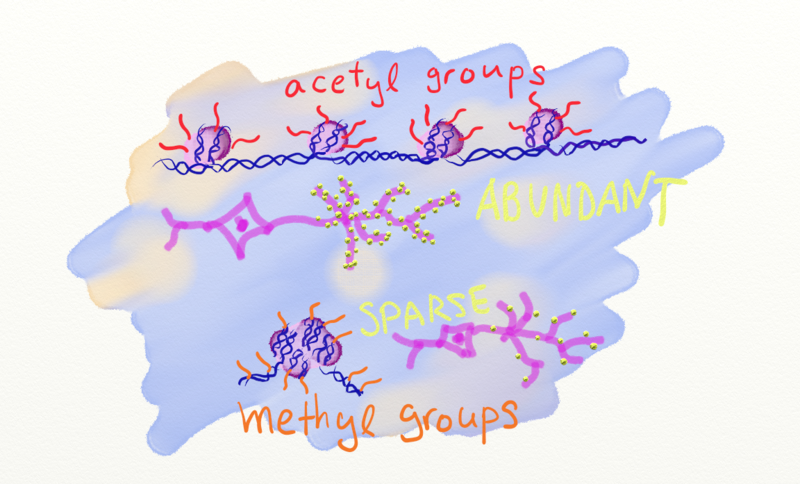 Some quick sketches that might help put the fast-growing epigenetics and cognitive development literature into context. Visit the University of Utah’s Epigenetics training site for more background! The genome is just the A,G,T,C bases that encode proteins and other mRNA molecules. 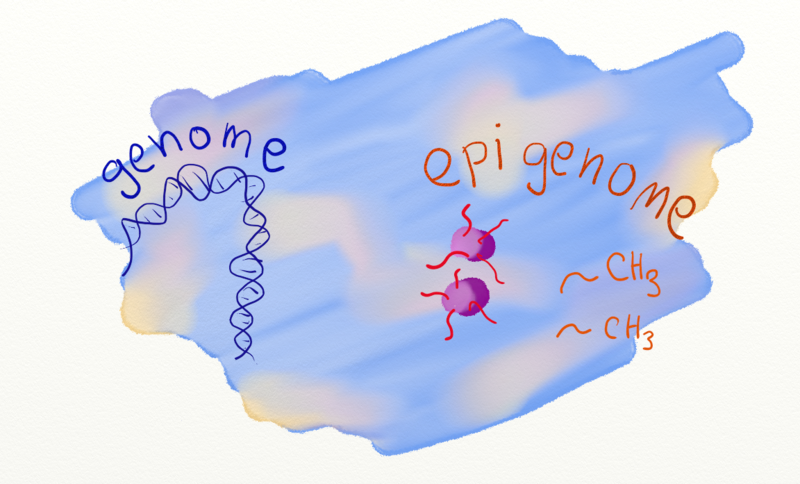 The “epi”genome are various modification to the DNA – such as methylation (at C residues) – and acetylation of histone proteins. These changes help the DNA form various secondary and tertiary structures that can facilitate or block the interaction of DNA with the transcriptional machinery. 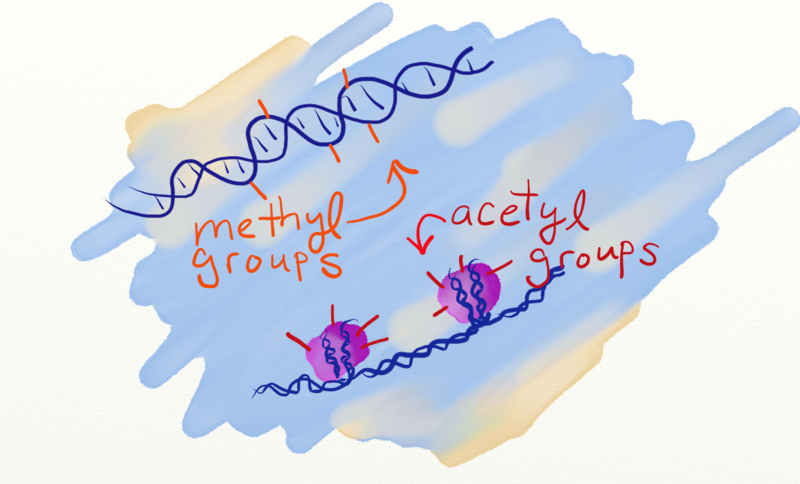 When DNA is highly methylated, it generally is less accessible for transcription and hence gene expression is reduced. When histone proteins (purple blobs that help DNA coil into a compact shape) are acetylated, the DNA is much more accessible and gene expression goes up. We know that proper epigenetic regulation is critical for cognitive development because mutations in MeCP2 – a protein that binds to methylated C residues – leads to Rett syndrome. 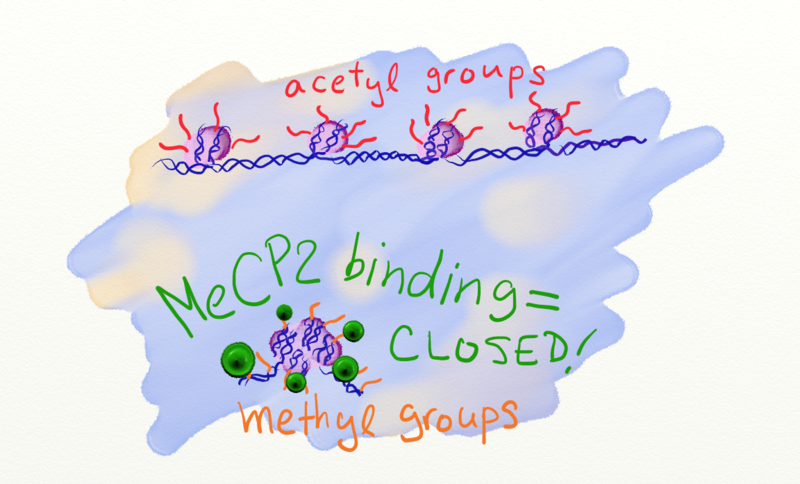 MeCP2 is normally responsible for binding to methylated DNA and recruiting histone de-acetylases (HDACs) to help DNA coil and condense into a closed form that is inaccessible for gene expression (related post here). When DNA is accessible for gene expression, then it appears that – during brain development – there are relatively more synaptic spines produced (related post here). Is this a good thing? Rett syndrome would suggest that – NO – too many synaptic spines and too much excitatory activity during brain development may not be optimal. 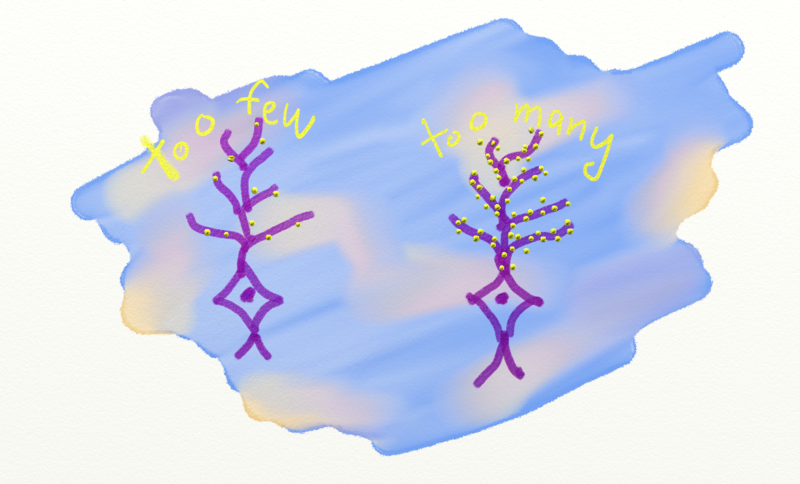 Neither is too little excitatory (too much inhibitory) activity and too few synaptic spines. It is likely that you need just the right balance (related post here). 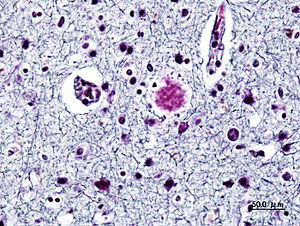 Some have argued (here) that autism & schizophrenia are consequences of too many & too few synapses during development. The sketch above illustrates a theoretical conjecture – not a scenario that has been verified by extensive scientific study. It tries to explain why epigenetic effects can, in practice, be difficult to disentangle from true (changes in the A,G,T,C sequence) genetic effects. This is because – for one reason – a mother’s experience (extreme stress, malnutrition, chemical toxins) can – based on some evidence – exert an effect on the methylation of her child’s genome. Keep in mind, that methylation is normal and widespread throughout the genome during development. 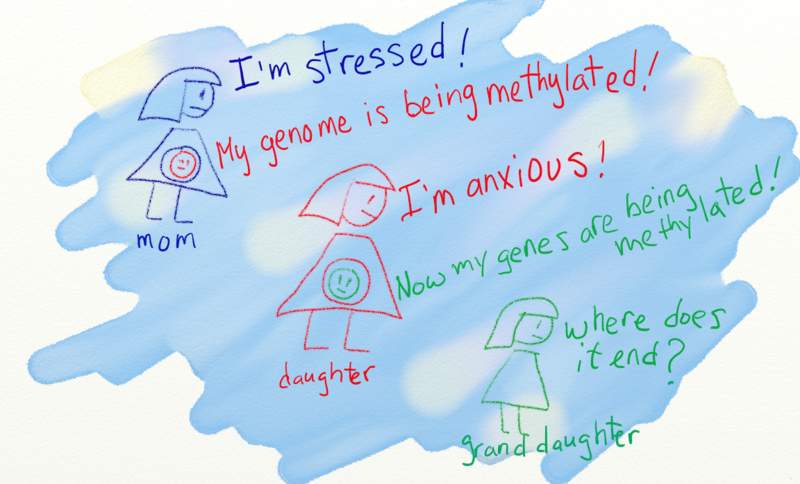 However, in this scenario, if the daughter’s behavior or physiology were to be influenced by such methylation, then she could, in theory, when reaching reproductive age, expose her developing child to an environment that leads to altered methylation (shown here of the grandaughter’s genome). Thus, an epigenetic change would look much like there is a genetic variant being passed from one generation to the next, but such a genetic variant need not exist (related post here, here) – as its an epigenetic phenomenon. Genes such as BDNF have been the focus of many genetic/epigenetic studies (here, here) – however, much, much more work remains to determine and understand just how much stress/malnutrition/toxin exposure is enough to cause such multi-generational effects. Disentangling the interaction of genetics with the environment (and its influence on the epigenome) is a complex task, and it is very difficult to prove the conjecture/model above, so be sure to read the literature and popular press on these topics carefully. According to Joseph LeDoux, “One of the most important contributions of modern neuroscience has been to show that the nature/nurture debate operates around a false dichotomy: the assumption that biology, on one hand, and lived experience, on the other, affect us in fundamentally different ways” (ref). Indeed. While I know not where the current debate stands, I’d like to point to a fantastic example of just how inextricably linked the genome is to the environment. In their recent paper, “A Biological Function for the Neuronal Activity-Dependent Component of Bdnf Transcription in the Development of Cortical Inhibition” [doi:10.1016/j.neuron.2008.09.024] Hong et al., ask what happens when you take away the ability of a given gene to respond to the environment. This is not a traditional “knockout” experiment – where the gene is inactivated from the moment of conception onwards – but rather a much more subtle type of experimental manipulation. What happens when you prevent nurture from exerting an effect on gene expression? The team focused on the BDNF gene whose transcription can be initiated from any one of eight promoter sites (I-XIII). These sites vary in activity depending on the phase of development and/or the tissue or type of cell – all of which make for a complex set of instructions able to turn the BDNF gene on and off in precise developmental and/or tissue-specific ways. In the case of promoter IV, it appears to be triggered in the cortex in response to Ca++ release that occurs when neurons are firing – a phenomena called, “neuronal activity dependent transcription” – a top example of how the environment can influence gene expression. Seeing as how BDNF promoter IV is important for this type of environment-induced gene expression, the team asked what happens when you remove this particular promoter? To do this, the team constructed – keep in mind that these are – mice that contain mutations in several of the Calcium (Ca++) response elements in the promoter IV region. They introduced point mutations so that the Ca++ sensitive protein CREB could not bind to the promoter and activate gene expression. OK, so what happens? Firstly, the team reports that the mutant mice are more or less indistinguishable from controls in appearance, gait, growth rate, brain size and can also reproduce and transmit the mutations. WOW! Is that one strike AGAINST nurture? The team then shows that BDNF levels are more than 50% reduced in cultured neurons, but that levels of other immediate early genes are NOT affected (as expected). In living animals, the effects were similar when they asked how much gene expression occurs in the sensory cortex when animals are exposed to light (after an extended period of darkness). OK, so there are few effects, so far, other than lower levels of nurture-induced BDNF expression – hmmm. Looking more closely however, the team found that the mutant mice generated lower levels of inhibitory neuron activity – as measured by the firing of miniature inhibitory postsynaptic currents. Follow-on results showed that the total number of inhibitory neurons (parvalbumin and NPY + GABAergic cells) was no different than controls and so it would seem that the activity dependence of BDNF is important for the maintenance of inhibitory synapses. Hence, the team has found that what “nurture” does (via the BDNF promoter IV in this case) is to exert an effect on the connectivity of inhibitory neurons. Wow, thanks mother nurture! Although it may seem like an obscure role for something as important as THE environment, the team points out that the relative balance of excitation-to-inhibition (yin-yang as covered here for Rett syndrome) is crucial for proper cognitive development. 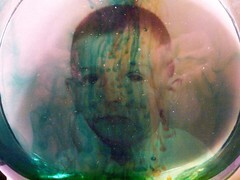 To explore the notion of inhibory/excitation balance further, check out this (TED link) video lecture, where Michael Merzenich describes this imbalance as a “signal-to-noise” problem wherein some children’s brains are rather noisy (due to any number of genetic/environmental reasons – such as, perhaps, poorly maintained inhibitory connections). This can make it harder to develop and function in life. Perhaps someday, the genetic/environment research like that of Hong and colleagues will inform the rehabilitative strategies developed by Merzenich. In Robert Sapolsky’s book, “Why Zebras Don’t Get Ulcers“, he details a biological feedback system wherein psychological stress leads to the release of glucocorticoids that have beneficial effects in the near-term but negative effects (e.g. ulcers, depression, etc.) in the long-term. The key to getting the near-term benefits and avoiding the long-term costs – is to be able to turn OFF the flow of glucocorticoids. This is normally dependent on circuitry involving the frontal cortex and hippocampus, that allow individuals to reset their expectations and acknowledge that everything is OK again. Here’s the catch (i.e. mother nature’s ironic sense of humor). These very glucocorticoids can initiate a kind of reorganization or ‘shrinkage’ to the hippocampus – and this can disable, or undermine the ability of the hippocampus to turn OFF the flow of glucocorticoids. Yes, that’s right, the very switch that turns OFF glucocorticoid flow is disabled by exposure to glucocorticoids! Can you imagine what happens when that switch (hippocampus) get progressively more disabled? Your ability to turn OFF glucocorticoids gets progressively worse and the negative effects of stress become more and more difficult to cope with. Sounds depressing. Indeed it is, and there are many findings of reduced hippocampal volume in various depressive illnesses. The complex problem at hand, then, is how to reverse the runaway-train-like (depression leads to glucocorticoids which leads to smaller hippocampus which leads to more depression) effects of stress and depression? One new avenue of research has been focused on the ability of the hippocampus to normally produce new cells – neurogenesis – throughout life. Might such cells be useful in reversing hippocampal remodeling (shrinkage)? If so, what molecules or genes might be targeted to drive this process in a treatment setting? The recent paper by Joffe and colleagues, “Brain derived neurotrophic factor Val66Met polymorphism, the five factor model of personality and hippocampal volume: Implications for depressive illness” [doi: 10.1002/hbm.20592] offers some key insights. They examined 467 healthy participants of the Brain Resource International Database (a personalized medicine company with a focus on brain health) using personality tests, structural brain imaging and genotyping for an A-to-G variation (valine-to-methionine) polymorphism in the BDNF gene. They report that lower volume of the hippocampus was associated with higher scores of neuroticism (worriers) – but, this negative relationship was not found in all people – just those who carry the A- or methionine-allele. Thus, those individuals who carry the G/G (valine/valine) genotype of BDNF may be somewhat more protected from the negative (hippocampal remodeling) effects of psychological stress. Interestingly, the BDNF gene seems to play a role in brain repair! So perhaps this neuro-biochemical pathway can be explored to further therapeutic benefit. Exciting!! 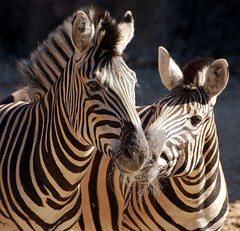 By the way, the reason zebras don’t get ulcers, is because their life revolves around a lot of short term stressors (mainly hungry lions) where the glucocorticoid-stress system works wonderfully to keep them alive. Its only homo sapiens who has enough long-term memory to sit around in front of the TV and incessantly fret about the mortgage, the neighbors, the 401K etc., who have the capacity to bring down all the negative, toxic effects of chronic glucocorticoids exposure upon themselves. My 23andMe profile shows that I am a G/G valine/valine … does this mean I’m free to worry more? Now I’m worried. More on BDNF here. Having blogged here several times on various and sundry roles of BDNF in cognitive function, it was pretty cool to see the recent paper, “Neural stem cells improve cognition via BDNF in a transgenic model of Alzheimer disease” [doi: 10.1073/pnas.0901402106]. It seems that in a transgenic mouse model for Alzheimer’s Disease that injection of neural stem cells into the plaqued/tangled hippocampus can rescue hippocampal-dependent behaviors. This rescue however, seems to have been dependent on the secretion of BDNF since knock-down of BDNF ablated the rescue, while increasing BDNF improved the rescue. The stem-cell treatment did not however reduce levels of plaques or tangles but did increase synaptic density – which I’d be happy to have more of – plaques/tangles notwithstanding. Promising findings! Recently, the media has mourned the 5HTT-LPR which was stripped of its celebrity risk-allele status. Another gene however, the BDNF val66met variant (just a B-list celeb at the moment) has been slowly acquiring similar interest as the genetic variant that can be counted on to confer a biological association with any number of brain-based phenotypes, behaviors and – dare I say – grant funding. Not so fast – according to Verhagen et al., in their recent, “Meta-analysis of the BDNF Val66Met polymorphism in major depressive disorder: effects of gender and ethnicity” [doi: 10.1038/mp.2008.109]. Here they report on 2,812 cases and 10,843 controls from 12 research studies on major depression. Their analysis found no overall association of the Met allele with major depression. However, when they consider just men who carry the Met/Met genotype, there was a significant association with risk of MDD. Perhaps amidst the clamor as BDNF rises to the celebrity darling du jour, we can think more on the futility of the “disorder x genotype” approach in general and more on how best to make sense of – and productive use of – our genetic information. Genetic associations (spurious as they are) with DSM-IV clinical descriptions may not be particularly meaningful. Somehow, the basic biology and the clinical descriptions of what we call mental illness do not seem to be linking-up very well. 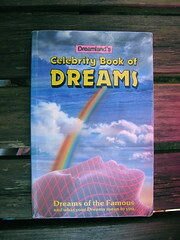 Perhaps more celebrity-genes will have to fall from grace before we come to a new conceptual paradigm. Among mammalian species, moms can have it rough. THEY do the foraging and the child rearing usually without the help of dad who may or may not be prancing about defending his territory or doing who knows what. The biological systems that manage such a predicament for the female would, not surprisingly, be highly regulated and, I imagine, a major target of natural selection. For example, conflicts between what’s best for the offspring and what’s best for mom could drive the evolution of genetic and epigenetic mechanisms that counter-balance the tendency of moms to conserve resources and for offspring to use resources. One such epigenetic mechamism that has been implicated in parent-offspring conflict is so-called genomic imprinting – wherein certain epigenetic marks (methylation of C*pG’s in many cases) leads to the expression of genes a parent-of-origin-type manner (eg. the gene inherited from mom might be expressed while the gene inherited from dad would be transcriptionally repressed). With this link between epigenetics and maternal investment in mind (and with Mother’s Day around the corner) I enjoyed the recent paper, “Lasting Epigenetic Influence of Early-Life Adversity on the BDNF Gene” by Roth and colleagues [doi: 10.1016/j.biopsych.2008.11.028] where they measured the relationship between BDNF expression and methylation as a function of maternal behavior (in stressful and non-stressful) conditions. Like many other neuronally-expressed genes, stress seems to lead to more methylation, which can – sometimes – interfere with transcription. In the Roth et al., paper, BDNF seems to show this pattern as well since BDNF was downregulated about 50% in the prefrontal cortex of rat pups who were reared under stressful conditions. Concomitant increases in methylation in the pups (which was blocked with methyltransferase inhibitors) was examined as a possible reason for the BDNF downregulation. Most interestingly, the female pups who were raised by stressed moms – were themselves lousy moms (demonstrated poor licking and grooming behavior) and gave birth to pups (granddaughters) who also bore similar epigenetic marks on BDNF. Is this maternal-care/epigenetics phenomena related to parent-offspring conflict? Perhaps so, or perhaps just a spandrel or an unintended consequence of other levels of regulation. It will be fun to explore this further. 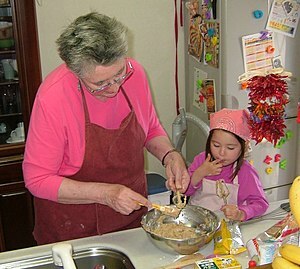 Until then – be sure to thank your GRANDmother on Mother’s Day! – or not, if your are poorly groomed. Kala Pierson on What is the sound of Aum? Jeremy Peirce on What is the sound of Aum?